Popular Japanese messaging service Line is well known for its stickers but now the company is expanding its feature set even further with the inclusion of a new data-based calling service. Line will begin to offer two different voice calling plans starting next month, a monthly plan and a pay-as-you-go set-up said to become available in the US, Mexico, Spain, Thailand, the Philippines and Japan. Much like Skype, the new service will allow Line users to contact people who don't use the chat app. Hands on reports say Line calls on smartphones are nicely integrated and appear just like any other normal call. In Japan, the monthly plan is priced at around 6.4 cents per minute (to a max of 60 minutes) and supports both landline and mobile calls. While Line will be handing out special promotional packages across Japan, as well as discounted trial periods for its new voice call service, the company also launched a brand new platform today, the Line Creators Market. 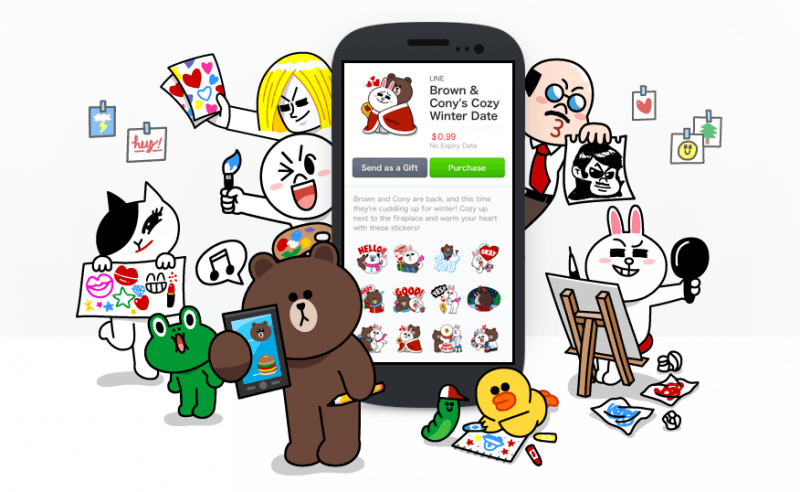 It is a place where Line users can sell their custom made stickers to each other. Users interested in selling can register for free and offer sets of 40 stickers for about $1. Line will have to approve your images first and will retain 50% of the profits. The company sees its sticker business as being something that will help the service to grow its user base worldwide saying it “looks forward to accelerating Line’s global expansion with the further localization of stickers through this effort.” Line counted $338 million in revenue in 2013, of which 20% was attributed directly to sticker sales.